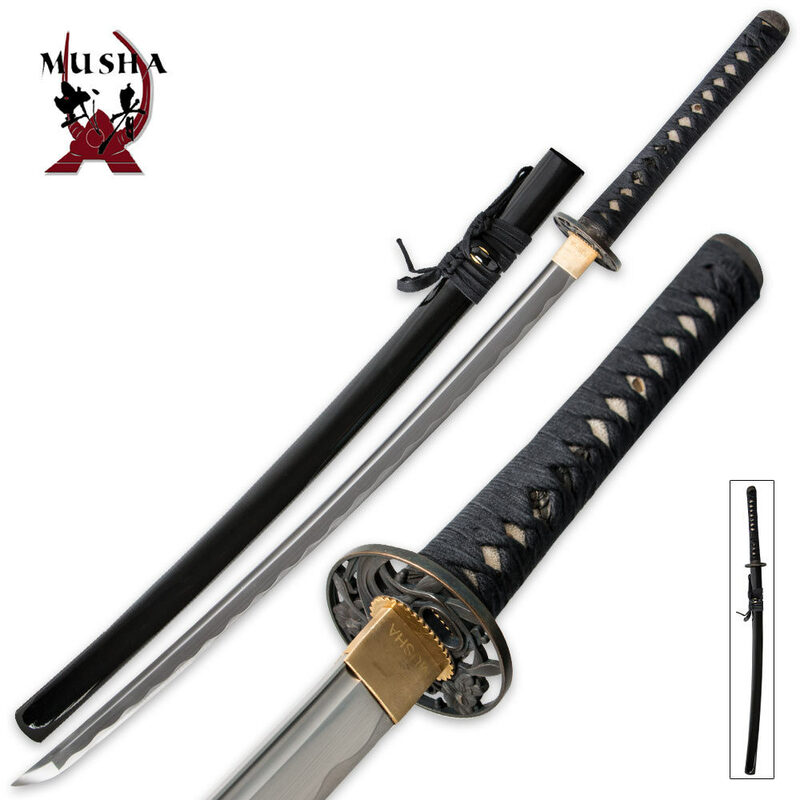 Oriental Pearl Musha Bushido Sword | BUDK.com - Knives & Swords At The Lowest Prices! The Oriental Pearl Musha Bushido Sword is both elegant and battle ready! 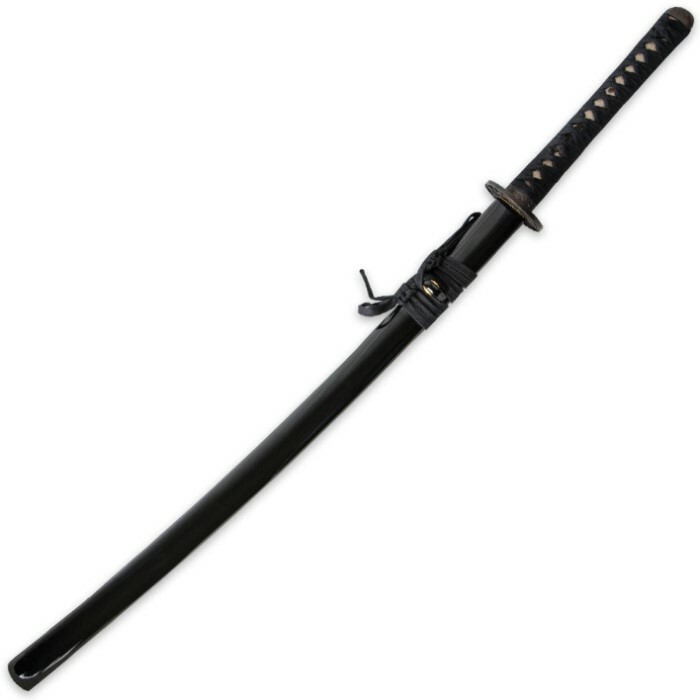 This sword features a beautiful, full-tang, high carbon steel blade that has been honed to a razor sharp edge. The handle is constructed of hardwood and offers ray skin with tight cotton cord wrappings. The copper tsuba features an ornate floral design to complement the high gloss scabbard and metal fittings. Get your own highly sought after sword today! It said 7 to 10 business days and it showed up in 4 business days! I live in Florida and the budk warehouse is in Georgia so keep that in mind though. Excellent sword, balanced, razor sharp, high carbon steel, full tang with bamboo pegs. Tightly wrapped cotton cord handle is right on the money. I also managed to get this with a promo code so the shipping was free! For $50 you couldn't ask for a better katana. 5 stars!!!!! for this price it is an awesome sword. design is simple but still classy. was delivered in only a few days without any damage. sharp enough to cut up box delivered into shreds. hehe! this is my first purchase thru truesword and i am impressed. all you need to know is this is a 10/10 sword. no loose fitting wrap. cuts through tatami like a hot knife like butter. even my brother whos never held a katana could cut the stuff. and for 60$ this is a steal. This sword is amazing! It is very sharp and strong. It is very worth the price and I recommend it to anyone who likes swords. Good job true swords! It's a great buy, my first good sword I bought. No damage to it from shipping, very light. The cord on the handle is much darker than the image, I was hoping it was that greenish color. I cut the shipping box in half, and no damage to it at all. The China stamp doesn't bother me because of the place it is in, and it actually appears faded. Very, very pleased with my purchase. Im absolutley happy with this buy! There are swords like this at pawn shops for 150 dollars. If you are thinking about buying this, do it! you wont get a better deal. This is my first buy from True Swords and there are still many many many more to come!